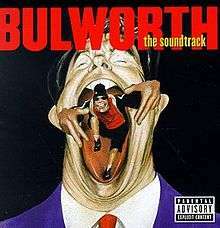 Bulworth is the soundtrack to the film Bulworth. The soundtrack was certified Platinum by the RIAA with over 1,000,000 copies sold. ↑ "Recording Industry Association of America". RIAA. Archived from the original on 2007-06-26. Retrieved 2012-02-09. ↑ "Music Albums, Top 200 Albums & Music Album Charts". Billboard.com. 1998-07-11. Retrieved 2012-02-09. ↑ "Top Hip-Hop and R&B Albums & Charts". Billboard.com. 1998-06-06. Retrieved 2012-02-09.